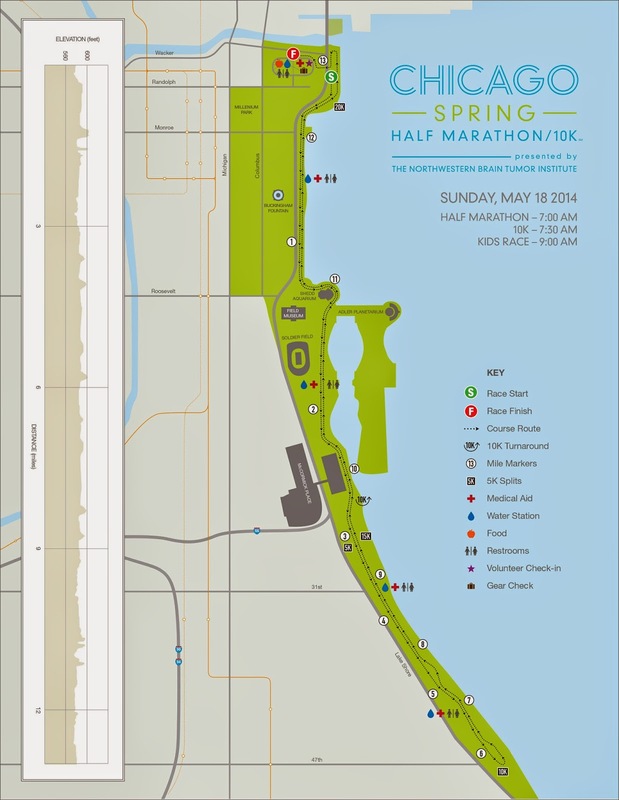 The Chicago Spring Half Marathon was held on Sunday, May 18 at 7:00 am at the Park at Lakeshore East. 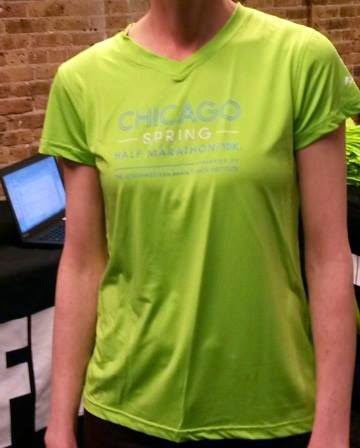 Packet pick-up was being held at Fleet Feet in Old Town Thursday–Saturday. I went on Friday during my lunch hour. Pick-up was easy breezy, all of it held within the store (sometimes they use the lobby of the building for bibs and then the shirts are in the back of the store). I grabbed the bibs for both my mom and myself along with the t-shirts (which were cute, a nice lime green color). 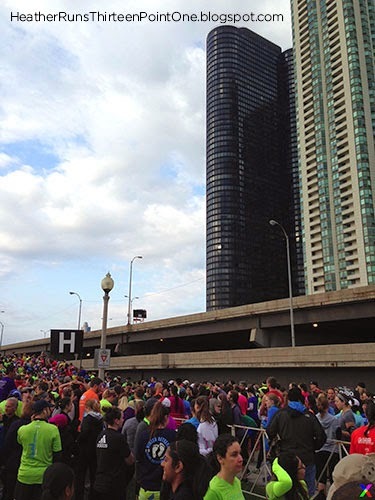 Photos from Chicago Spring Half Marathon Facebook Page. I decided that it would be easiest for my mom and I to drive into the city and park rather than take public transit – it would be faster, and I'm much more comfortable feeling gross in my car rather than on a train after a race haha. We got to the Millenium Lakeside Garage around 6 o'clock (we like to give ourselves ample time to drive, as you never know what the construction and/or traffic will be like). We hung out in the car for about 30 minutes, eating our Nature Valley Oats and Honey granola bars and chatting. We made our way over to the park at 6:30 and went straight to the portalets. There were a good amount of them, but the lines were a little wacky because tents and other items were in the way. Since there were groupings of the portalets around the area, each group had 1–2 lines of people waiting for the approximately 15 portalets. Some people thought it was ok to form their own lines (aka cut), but the majority of people waited patiently. We chose a line and were in it for about 15 minutes. One of the workers came around at 6:50 announcing the start of the race in 10 minutes and that we should all make our way over to the starting area (which was a little ways away from the finish/picnic/toilet area), and if you could hold it you should. I don't think anyone paid much attention to that idea. Pretty view while we wait. Headed to the starting line. 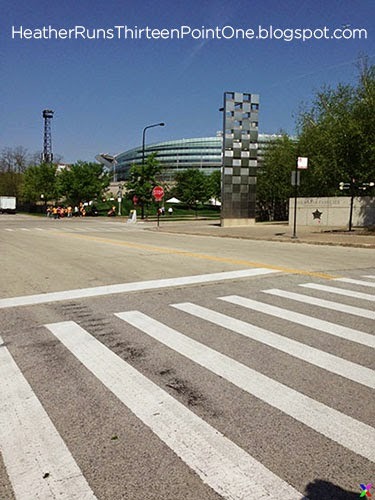 The course started south on the lakefront path, past the Shedd Aquarium, Field Museum, Soldier Field, and McCormick Place. The turnaround was at the 10k mark, and then you followed the same path back to the finish. 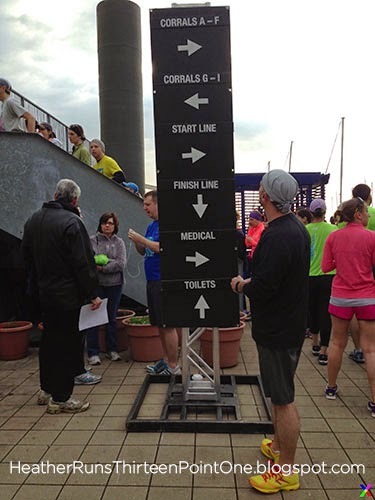 The finish was different than the start, so you ran past where you started and then took a little bit of a turnaround under a bridge, up a (sort of small) hill and over to the finish. Chicago skyline heading back towards the finish. Soldier Field on the way back. 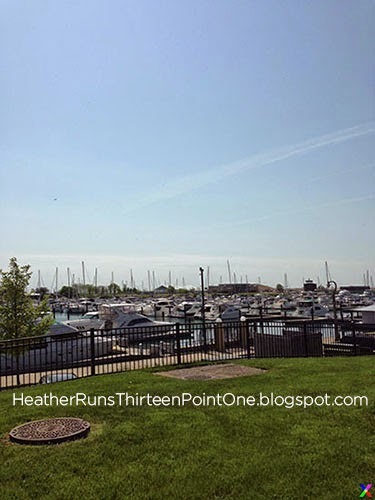 Running on the lakefront path is so wonderful – I love the view from any direction, but I think running back towards the city is always the best (city skyline AND the glistening water of the lake are both in view). There were plenty of aid stations along the way (a total of 8) and each had water, gatorade, medical tent, and bathrooms (portalets). The volunteers were all friendly and encouraging. There wasn't too much congestion on the path, either (for me at least. It always gets a bit messy once you have the faster runners coming back and the rest of the pack still going out, but it wasn't so bad.). The path is still open to the public, so it can be difficult at times to not get run over by cyclists or tourists on rented bikes. Some, but not many, make their presence known with a bell or a quick shout of 'bike on your left', but most just ride so close and practically run you over. It's frustrating, but not much can be done other than to try and listen for them and stay to the side when you can. There was a 16-minute pace requirement for this race. They also had pace groups this year, though, like most races, I am too slow to utilize. Maybe by next year I can be in the 2:45 group :) Clocks were stationed at every mile marker, and the turn around was easily marked, as was the way to the finish (which was a bit weird, but I understood where to go). The skyline from behind the Shedd Aquarium. Since I had gotten my PR in the half marathon 2 weeks prior, I decided to stay with my mom for this race (though, she's not much slower than I am. She walks more than she runs, but she is quick with those walks). I also hadn't ran much since the other half, as I was trying to let my blisters heal for this race. It was nice to have the companionship and chatter to help the miles melt away. Races go a lot faster when I'm with someone, though sometimes I enjoy just listening to music and being in a groove. Pros and cons to each, I guess, but I like to mix it up depending on how I'm feeling that day. My feet weren't nearly as bad as they were two weeks ago, but they were still a bit sore, since they hadn't healed completely yet. I did wear moleskin, which I think helped. Other than my feet, I felt good the whole race. 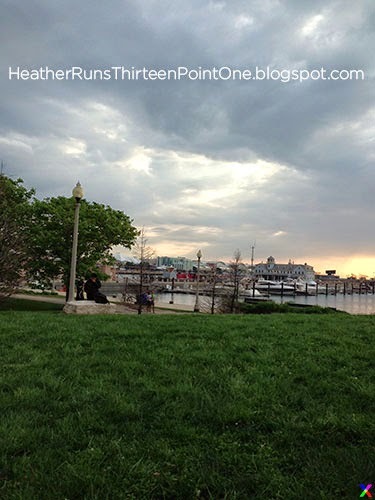 I took a Clif Shot Blok about every 2.5 miles and we did 30 seconds run and 2 minutes walking for our intervals. Officially, our finish time was a little over 3:10, so really not that far off from my PR. This year is definitely going better than last year, as far as finish times and nerves. Huzzah! Panoramic view of the picnic. After receiving our medals, water, gatorade, and snack bars (I forget what brand, but I want to say Lara bars), we hit up the picnic portion. The post race picnic had the best food I've ever had post race (catered by Goose Island). There was a buffet (you could only enter using the ticket that was on your bib) with pancakes, sausage, egg whites, watermelon, and potatoes. Yum. 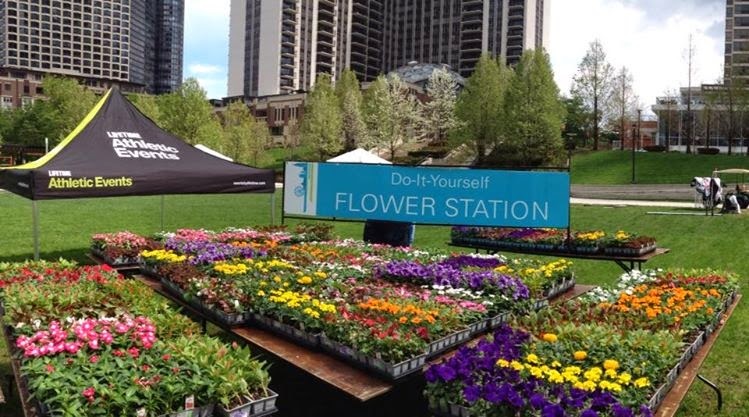 Along with a great buffet, they also had a free massage tent, a flower planting station (you got to plant your own flower and bring it home, what a cute idea), and a few vendors (medal display, TomTom had their new GPS watch, etc). It was nice to finish and relax in the park afterwards. 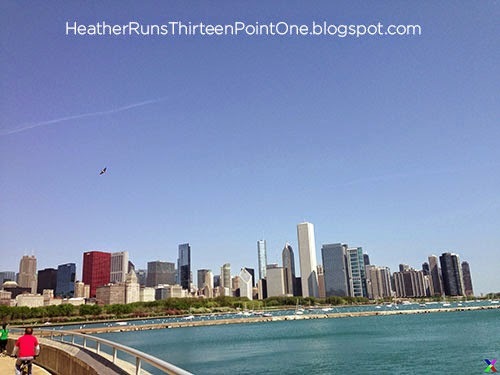 Chicago Spring Half Marathon Facebook Page. I would definitely do this race again, and I give it high marks as far as races go. 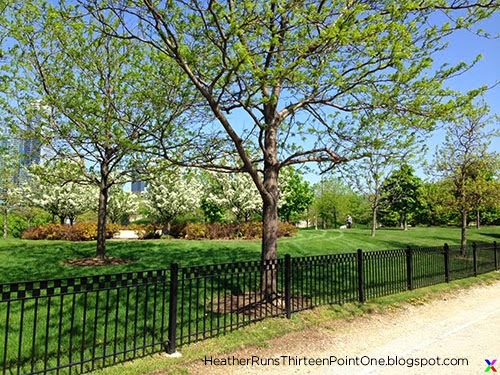 I know the lakefront path can be a bit of a hassle with non-racers, but since I'm used to it and know beforehand that it can be a pain, I feel I can keep my expectations in check and have a nice race day. 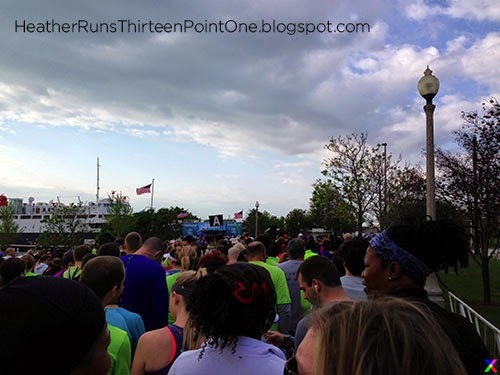 One of the reasons we ended up registering for this race is because it's party of the Chicagoland Half Marathon Series. Last year I completed the Windy City Challenge and got an extra medal (the challenge was to complete the Allstate 13.1 in June and the Chicago Half Marathon in September). This year, they changed the name and added another option. 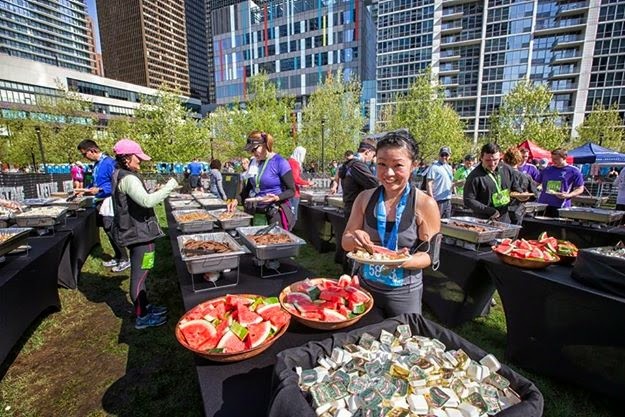 You could complete either the Chicago Spring Half Marathon or the Michelob Ultra 13.1 (formerly Allstate) AND the Chicago Half, or complete all three, for an extra bling and some race perks. 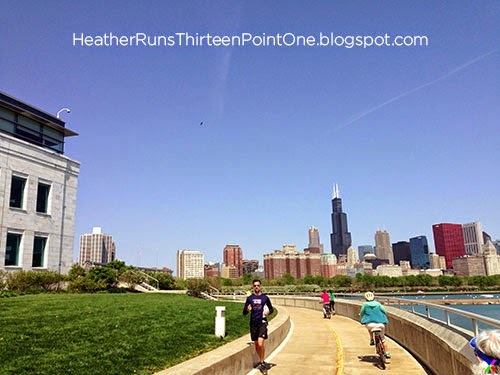 When I heard about this new challenge, I was already registered for the Michelob Ultra and the Chicago Half, so I figured why not add the third race. 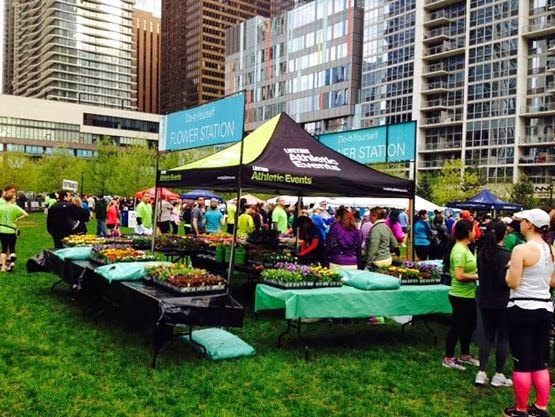 • Priority packet pickup line at the Hyundai Hope on Wheels Health & Fitness Expo for the Chicago Half Marathon. 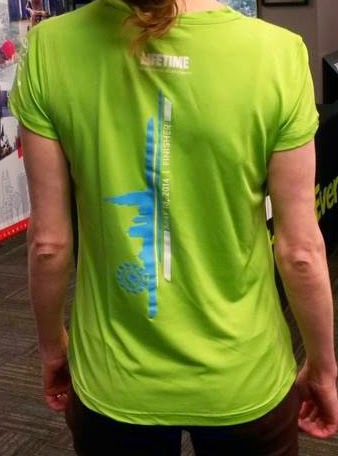 • Chicagoland Half Marathon Series runner dedicated gear check and reunite at Chicago Half Marathon. 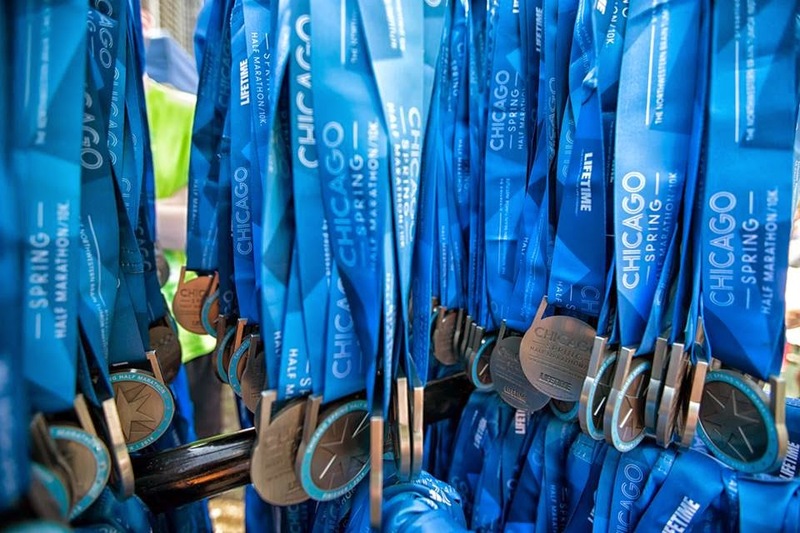 • Participants who complete all three events within the Chicagoland Half Marathon Series will receive a commemorative finisher medal. 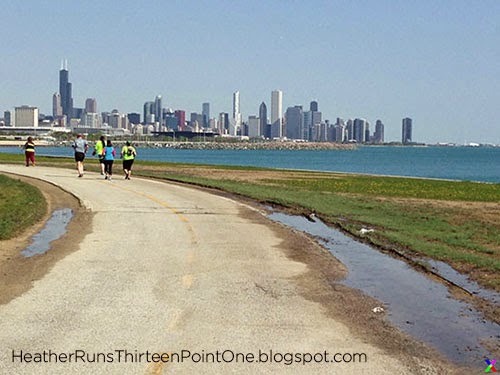 • 39.3 Series Finishers will receive a digital Chicagoland Half Marathon Series Finisher Certificate. 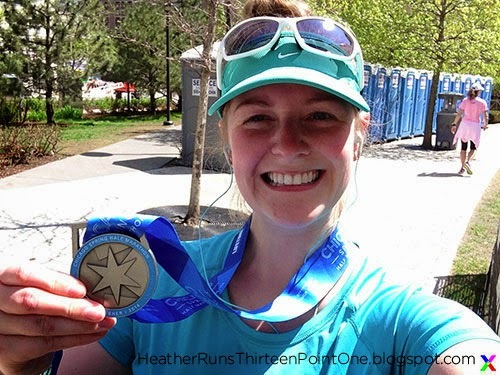 Editors note: I did a BibRave review on this race - check it out here!